Simon Crab dwells in paradoxes, though not always by design. For instance, he is an honest-to-goodness, practising anarchist, yet also a leader, though not always by choice. He is anti-capitalist, yet can play the game better than most. Crab is actively against material acquisition, yet is behind the reissues of sought-after after box sets of the back catalogue of his band, Bourbonese Qualk, whom he dismisses collectors as a "male cult of obscurity." Fellow band members deride Crab for his "pissy intransigence," a charge that Crab does not deny, yet is near-paralyzed with indecisiveness as a solo artist. Simon Crab is also very much an aspiring idealist and humane being, even if he has to beat up a few cops and skinheads along the way. This is without getting into the time he spiked Margaret Thatcher's champagne with LSD, but that is another story. Crab considers himself a non-musician, yet is oddly quite good at playing guitar, clarinet, gamelan-percussion, and especially electronics. In fact, his favourite musical instrument is the computer. Whereas classically trained musicians assert that there is no artistry in computers, Crab asserts there is no artistry required to play a musical instrument well. But we will get to that later. Crab's 'music career' spans nearly four decades, and continues as of this writing, if your definition of said occupation includes riot and confrontation whenever possible. But let's take it to the beginning. Crab started as a precocious young music enthusiast during the late '70's, with his brother, who co-founded Bourbonese Qualk, from their parents' garage. There was too much thought put into the name and they figured it was best to pick one name and stick with it to the bitter end. Some would argue, had their name been a hair catchier, they might have been more popular. But really, what does the proletariat know? Crab was born during the Cuban missile crisis and raised during the heightened tensions between the Western allied countries and Soviet Bloc states. A strong memory for Crab during the '70's was news reports of Trident missiles deployed in British fleet subs aimed at Soviet blocs, and it seemed to him that seeing adulthood was unlikely. As such, Crab devoted his energies to the burgeoning underground scenes that reflected the doomy, 'end-of-the-world' mood he felt and immersed in a post-punk era of what was then called 'Power Electronics', and Industrial, as well as New/No-Wave and early electronics amidst contemporaries like Throbbing Gristle and Nocturnal Emissions. At home, he listened to Pere Ubu and Eric Satie, but in public, he liked dragging friends out to see transgressive shows by bands like Whitehouse that shocked and provoked. By the 80's, Crab flourished in the 'zine and mail art culture, swapped and released mixed tapes, and went on air to local community radio shows to play music and made calls-for-talent for his new record label, Recloose. Among first demo tapes, was from a graphics student from Salford, Bryn Jones, who studied at the London College of Printing and made music on the side under the moniker, E.g. Oblique Graph. Crab decided that he liked the demo, a 'chemical sounding' psychedelic electronic piece, and released it as the Tritypch EP in 1982, in 7-inch format before even his own band. The graphics student, Bryn Jones, changed his band moniker, from E.g Oblique Graph to Muslimgauze, to the chagrin of Crab, and released his first LP, Buddhist on Fire (1984). The two bands briefly toured together and did interviews to promote Buddhist on Fire but had a fallout and went separate ways. Bourbonese Qualk members became politically active for the Anarchist left, and this was reflected in their lyrics and album/track titles which were critical of the Left, whom they belonged to and even more of a UK society politically dominated by Thatcherite Conservatives who built a neo-Liberal regime that undermined the working class. BQ members lived and performed in squats, participated in riots, and recorded when not fighting both local police and skinhead thugs. As for Bourbonese Qualk, Crab's brother had left, but he acquired newer members such as young theatre actor Julian Gilbert, who was perfect on vocals, as well as an accomplished, if not a little troublesome drummer, Stephen Tanza. During this time, Crab was a student at the Slade School of Fine Art in London where he connected with fellow band members, as well as members of TG and Noctural Emissions who not only gave encouragement and moral support, but sold them used production and recording gear to the cash-strapped budding artists. Their first LP, released in 1983, was Laughing Afternoon and was the official start of a decades-long project spanning several albums, musical genres, tours, riots, nervous breakdowns, and ended with suicide of a member. Simon Crab was the only constant through the incarnations and the musical hub. By the late '80's, most of the original BQ members had left to pursue other passions. Gilbert went on to writing full time. Crab and Tanza did a final album together, just called Bourbonese Qualk which Crab considers an unpleasant experience and shortly after, they had a falling-out. While Crab kept the band same, Tanza went on to form another Industrial/electronic project called The State. During this time, Crab met guitarist Miles Miles, who also lived in a squat, but a more feral existence than he, as well as drummer, Owen If, where the band went to a more funk-Afro-ethno-Industrial direction and released My Government is My Soul(1989) and Unpop (1991). They toured and received good responses and growing popularity. However, this was also an emotionally trying time for Crab as he remembers, "After we'd done loads of tours and recording, I'd become tired of being the manager, tour manager, booking agent, composer, producer, record label, promoter, singer, musician, financier, bus mechanic and psychotherapist - at this point, the whole BQ crew was about eleven people and two tour buses and equipment. So, decided to take a break from the 'band' thing." Unpop was the last release with that incarnation of the band, save for Feeding the Hungry Ghost, a compilation of live BQ performances from 1986 to 1991. Owen If's other band was the Stereo MC's, the group who released the 1992 hit "Connected." Listen to Unpop and you will hear some of the same rhythms that the Stereo MC's later used. The Stereo MC's took-off in popularity and do did he, and Crab had had enough of the feral Miles Miles who, it seemed, was habitually out of control. Out of control meant, for instance, running out of the still-moving bus during tours and reappearing days later, after shows were done. By then, the UK, Europe, and pretty much all the Western world were in the throes of the electronic dance music renaissance. Crab joined with Christoph Fringeli, founder of the Praxis techno label to make the sole electro-gabber-techno BQ release, Autonomia (1993), which was also toured in the USA. "At the time, it felt that bands were becoming somewhat anachronistic with the emergence of the rave/acid scene and it seemed like we were doing a lot of work against a rising tide of indifference. So, I stopped for a while. I became more interested in pure electronics and minimizing a performance to one person and portable equipment." This would also be the first in an ongoing trend for Bourbonese Qualk and later, Crab's solo material, namely eschewing lyrics in favour of instrumentals. Comments Crab on this change, "When I started doing it, it was reasonably new. I'd get a good reaction because it was a bit shocking and aggressive and loud. And then it became stylized, something that everyone was doing. I could either continue doing that and it was against all the principles we set out to do, which was to not to do what everyone else was doing. There were a lot of bands influenced by the whole 'industrial' thing. So I stopped. Maybe it is the process of growing up. It is not that I am less angry, but I don't feel the need to harangue the masses in the same way." Apart from Feeding the Hungry Ghost, that was it for BQ for almost a decade. By the 1990's, Simon Crab became a father and he looked to offer more of a future for his family rather than just raising them in squats. Turned out that he was quite good at being the breadwinner. He founded a creative agency that became successful and acquired corporate clients like Nokia, Levis, Nintendo and Cadillac. While he was a sharp critic of capitalism, he was also good at playing the game. Perhaps it had to do with his sense of not being a part of the game that gave him a better perspective on how to play it. In the early 2000's, Simon Crab and Miles Miles united for the final incarnation of BQ, including the last studio release On Uncertainty (2001) and a live performance in Moscow, Russia, which was later released as a live album. Both releases denoted another shift in BQ's musical palette to abstract instrumental and abandoned techno hardware for computer-based digital synthesis via SuperCollider. SuperCollider is a real-time sythesis software program that can generate tones and manipulate audio based on programming languages and is now free, community-based software. On Uncertainty would also be the template for Crab's solo material, namely beats, instrumental fragments and abstract and melodic electronic. An art collective based in Shoreditch, UK, The Foundry, asked Crab and Miles to do a show in Moscow, along with other artists. When they arrived for the show, Miles took ill and confessed to Crab he was a heroin addict going through withdrawal and could not perform without a fix. They wound up scoring scag off Chechyn dealers to make the show happen. The show recording turned out well, though, and was the basis for the live release simply titled Moscow. On one side of the EP are sonar-esque echoes with haunting layers of guitar melodies and the other, sombre trumpet loops countering manic ones. Tragically, in 2002, Miles hung himself and that was the end of BQ. Though it was the end of BQ, it was not the end for Simon Crab, music maker; but it took him time to recover from the emotional fallout. He worked on an album with abstract-improvised audio experimentalist Andy Wilson in the project Sunseastar. 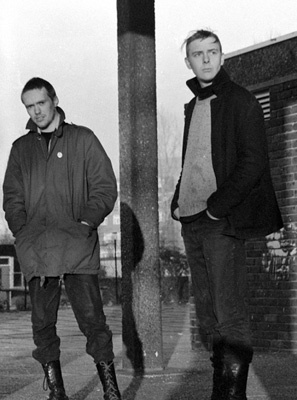 Their sole output was Fjaerland (2007) wherein Wilson provided improvised noise while Crab became more proficient at SuperCollider to produce shimmering electronic dub and drones reminiscent of the Basic Channel catalogue. However, for Crab, this felt more an Andy Wilson project than a true collaboration. Remarks Crab, "I am sort of dominating when it comes to music and I have strong ideas about what is right and wrong. I was working with Andy Wilson as Sunseastar and I think he commented recently that he had done the best recordings in his life with me because of my 'pissy intransigence.'" There was a significant gap in the release frequency of music since Crab went solo, which he attributes to a lack of fellow band members, "What I find difficult doing solo stuff is if you are working with a bunch of musicians, when I was working closely with Miles Miles for instance, we were really critical of each other's stuff. There is this ongoing dialogue and that acted as a good filter of getting rid of all the self-indulgent things. There were things you did not do because you would get torn apart. Or if there was something you did think was good, you would fight for it. So there is that kind of filter process. So rehearsing and performing had that kind of filtering thing. "The trouble with working solo is I find it very hard to finish. I have done loads of stuff, I am not sure I will release most of them. Working solo, you have to trust in your own judgment which is not always the best thing. I am always changing stuff. It is good to have that second and third voice to influence what you are doing. I really miss that. I am working with other musicians as well but the dynamic is different because you are working with (guest collaborator) drummer or a vocalist." Classically trained musicians often assert that there is no craft or musicianship in computer music compared to real instruments, but Crab counters, "It is interesting to use non-synth programming languages like SuperCollider. You are starting from absolute basic principles and then it generally sounds unlike anything else because there's no custom filters or units involved with it. If you use electronic instruments well, it takes a lot of work to make it good. There is so much electronic music which is default settings and kind of disco-techno. I find that really boring. To make it interesting is actually really hard. A basic thing to do and to never use anybody's patches or presets. Always start from the basic sounds and build your own sounds. Everything you do has a kind of identity. Avoid cliche's, these filtery-synthy sounds that everyone uses for some reason. I am sure it is easier to do electronic music badly but it is harder to do it well. Whereas I would say, to play guitar, is kind of fairly easy to play guitar acceptably." Well over a decade after Burbonese Qualk, and almost a decade after Sunseastar, Crab released After America (2014), this time under his own name. If the legendary ECM label were to release an electronic music album, this might be it. Simply look at the guest musicians credited; Geoff Leigh, of Henry Cow fame on flute and Dave Smith of Guapo on drums. After America is continuous, alternating between electronics and acoustic instrumentals from guitar, clarinet, and gamelan percussion. At times, there is even a sublime melding of electronics and instrumental such as "Useful Idiots," a wistful clarinet melody in a warbling electro-cocoon loop, while "Pareidolia" is a bittersweet blend of twangy guitar and dreamy gamelan rhythms. The closing piece, "Minus 20," is unmistakably a Bourbonese Qualk melody, a visit from a ghost of the past. With a politically charged album title, it is possible Crab may have some anti-American sentiments. Crab, however, dismisses this as a misinterpretation as he explains, "The idea was looking to the future, when America stops becoming the cultural influence on the world, which it is less of. It is something I used to talk about in advertising, in these speeches, like 'in ten years time, the biggest pop star will be Korean, not American.' Of course it happened. And that will become more and more so. We need to prepare for that cultural shift and we're not because we still look at it as being a West-Centric Empire." What Crab lost with a band, he discovered he was able to mitigate through live performance and instead gauges reactions of both the audience and live guest musicians. Crab admits, "I forgot how knackering it is. I'm not doing it just for the rock'n roll thrill of it. It is a way to meet different people and different musicians with three or four other groups that are playing. It is good to meet other people and be influenced by them. If you are a musician, which I'm not, it is important to perform. It actually makes your music better because you learn how people respond and you see how pieces work and you can change it live and it is part of the (music) building process as well." Crab's composition process is not conventionally structured. Though he does now set aside more of his daily life to make music while toning down day job scheduling, unless absolutely necessary. "It is a very random process. I just play around with different sounds and if I come up with something that works, I build on that sound. Generally it could evolve into something that becomes a track. If it does not work within the first quarter of an hour, than I generally discard it. If it becomes longer, it becomes overworked. Usually it simply a tune or rhythm or set of notes that interest me and I build on that. I do not sit down and write a tune that is within a set of chords or make it sound like 'something else.'" Crab also gets inspiration from touring as a musician. In fact, this was how he got a lot of melodies for BQ songs, "Recently, I was touring Switzerland and France and I was remembering Bourbonese Qualk days (when) we did a whole lot of tracks based on train alerts on the intercom when they made announcements, they have a little jingle at the beginning. In France, they have a certain tune and in Switzerland, it was a certain tune. I just kind of memorized these jaunty little tunes. If you make it into a minor scale they kind of become a bit darker. Generally, it has more to do with playing around with sounds." Around the release of After America, record labels Mannequin and Vinyl-on-Demand approached Crab and surviving ex-Bourbonese Qualk about reissuing the back catalogue as box sets and remix singles. Crab is ambivalent about the reissues since he does not consider himself a music collector, but more than that, he had already posted the entire BQ catalog for free MP3 download on the official BQ site after Miles Miles' demise. Though for archivists, MP3's were poor substitutes for high quality reissues. "It is a 'cult of obscurity.' It is an an aspect of consumerism, a male habit to own and control everything which I find weird and distasteful. The box set with Vinyl on Demand and Mannequin Record reissues... all of this stuff has been freely available on-line (as MP3's). What I'll do (now) is re-issue all of the stuff as FLAC and the box set as well because it is sold out. The physicality generates interest in a weird kind of way. I don't like it. I don't get it. I don't like being a part of it, but what do you do? Do you sink into obscurity and tell these people, 'no you can't have it, it's pure?'" Our world at yet another crossroads, Simon Crab's upcoming, Demand Full Automation (2018) presents our society's choice of either liberating the working class through automation, or further subduing them with it. Enter this rich, and meticulously crafted mostly electro-acoustic narrative with some instrumental excursions, that emphasizes more synthetic than natural textures, and on occasion, a sublime melding of the two. Demand Full Automation continues the narrative; ambient-atmospherically pensive some moments, but mostly energetic and upbeat, and relentlessly marching towards progress. But what kind of progress? Says Crab "(At the moment), the proletariat is being replaced by the precariat. It is a really interesting time, apart from all the kind of 'rise of fascism' and globalization. The big issue that nobody is looking at is automation and it seems to me that it can go one of either two ways; that can be the neo-liberal way in which corporates are going to use automation as a way of enriching themselves even further, irrespective of the workforce. The workforce is going to become completely irrelevant. That is the neo-liberal take on it which is a dystopian view of the world and it is clearly not going to end very well. The other view is that if you take more of a Marxist approach, taking control of the means of production, if the workers themselves control automation for the good of themselves, then there is a better future. Automation doesn't have to be a dystopian horror. It can easily be a liberating future. We should be having is classes in school to de-program kids from validating their lives by 'working.' My kids are not going to spend their lives working. The work could be a dystopian view which means we will have an underclass of servile people who will do what they are told, or, we can go the other view which is we will actually manage that automation. This will happen in the next 15 to 20 years, maybe sooner. In my view, this is a good thing. People shouldn't work. Work is a bad thing. People should be spending their lives doing things productive and useful. And at the moment, especially in the UK, people don't do anything. All the jobs people have are fake." Crab speaks of these concepts with passion and urgency to a point where one must ask, 'does the circumstance inspire the music, or does he tack his views onto music after the fact?' "There is a process where you can conglomerate all the work together, you can attach a title, you have to give it some kind of perceived meaning. So you think, 'what is important right now?' 'what kind of image, what kind of debate do I want to get involved in?' And it seems that is the most important thing right now. Obviously, there are issues with automation, and music, and culture and consumption- it is a media-specific concern as well as a political economy concern. I did not set out to make a concept album about automation (though)." Since Crab made and released music for almost four decades, often with a political charge, as music and activism are two sides of the same coin for him. He is among those who believe you cannot separate politics from art. The question surfaces, as the likes of Bob Dylan uses his music for ads for major banks and luxury brands, where does Crab see himself in the activist spectrum? "I have mostly stopped the (day job) consultancy stuff. I just do that for very specific clients and that is not very often. I am actually focusing 90% on music and video. I am doing a lot of video programming and video-synthesis stuff as well. I have (also) read a lot more books and have more theory to back up my arguments compared to when I started. In the early days things were a lot more spontaneous. I think (Bourbonese Qualk music) held up quite well considering the ridiculousness of recent histories. Supposedly, as you grow up you are supposed to get more sensitive and more conservative. I don't believe that for a second. I am probably more active than I ever was. When I am doing live stuff, I use very clear anti-fascist imagery because I think it is important to make a stand now and say clearly where you are."